Tonight was a good night. A delicious night. 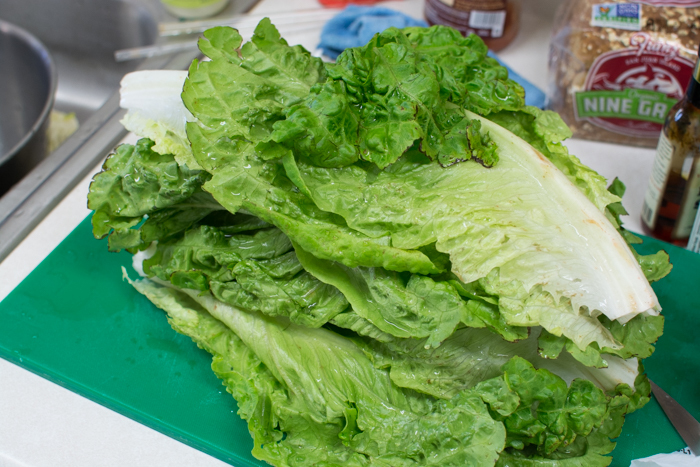 I picked up our fourth CSA share today and my mouth was almost pain-free. I couldn’t ask for more. I found out this week that I’ll be getting my first root canal on July 2nd. I look forward to it in a dreadful sort of way. I want the pain to be gone, but I’m not looking forward to hearing the drilling and holding my mouth open for an unknown period of time. But I’d like to repress all thoughts of that and instead focus on having an appetite for the first time in days thanks to the intermittent pain riding a down swing. Back to the CSA. Today’s share was full of collards, again bigger than my noggin, Swiss chard, bok choy, chioggia beets, green onions, cilantro, butter leaf lettuce, and cucumber. I’m going to share what I created from some of this bounty, stragglers in the cabinet, and a quick pickup at Dissmore’s. It’s kind of a guide, because I just threw things in as I went. A very close guide, but not precise. 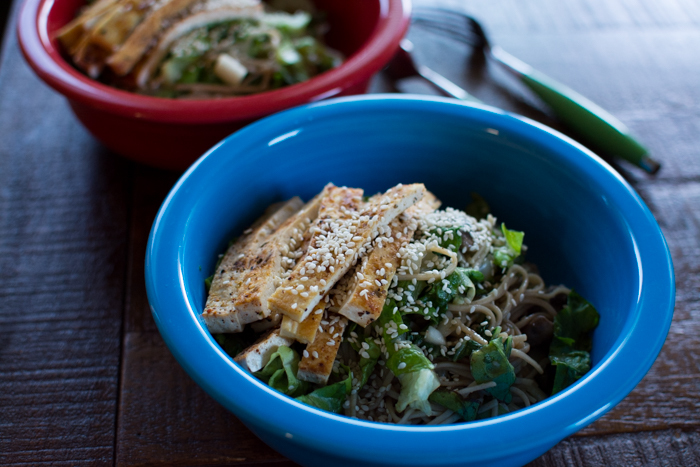 I used some romaine from last week’s share; bok choy, cilantro, and green onion from this week’s share; mushrooms and ginger from Dissmore’s; and some organic soba noodles from the pantry that were just dying to be used. 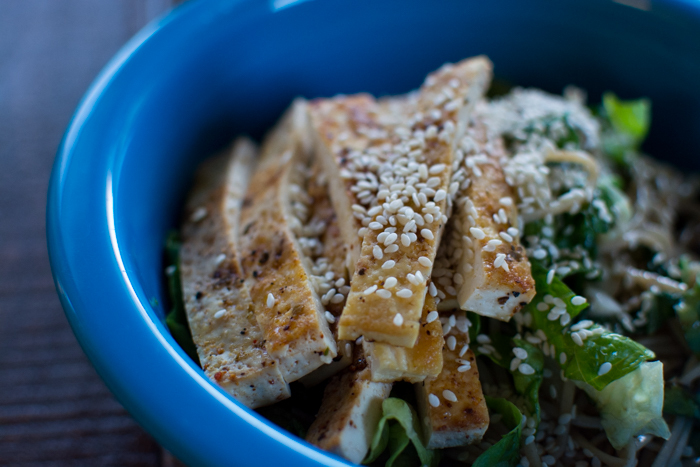 Topped off by some fresh cooked tofu, sesame seeds, and a quick blended dressing. 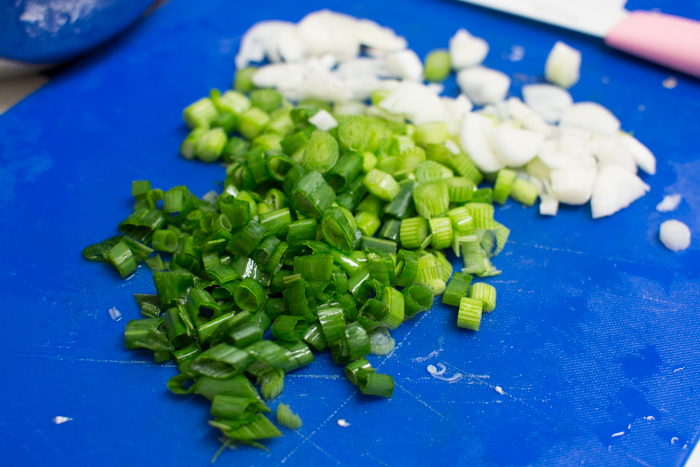 It’s savory and a little sweet with a few kicks from the onion, ginger, and garlic. 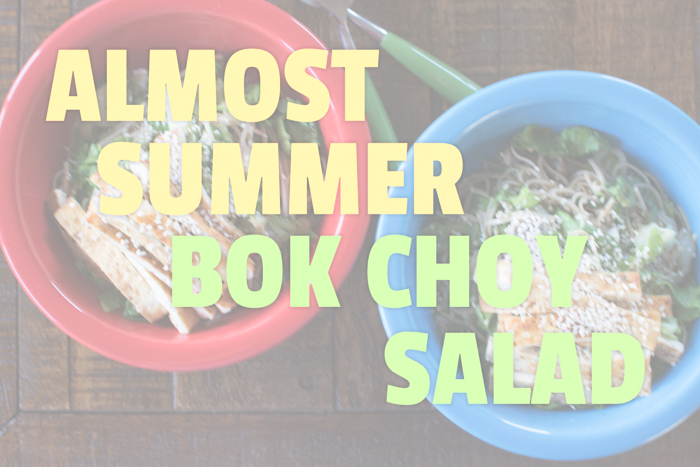 Half the ingredients were chilled, so it’s a nice not hot, not cold salad for an almost summer night. 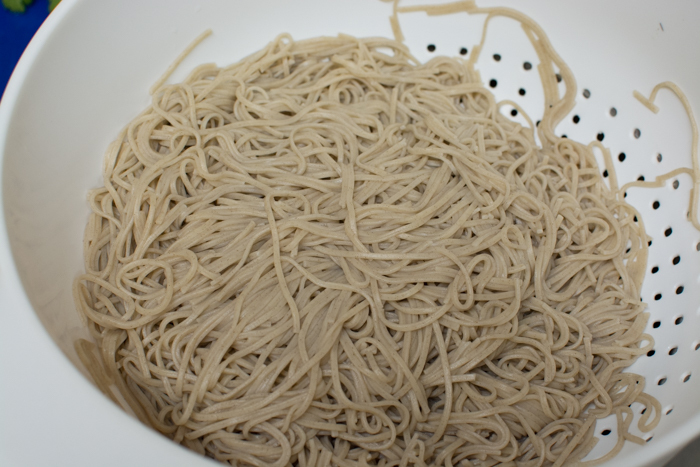 I started off by bringing water to boil for a package of organic Soba noodles, about a 9 oz package. 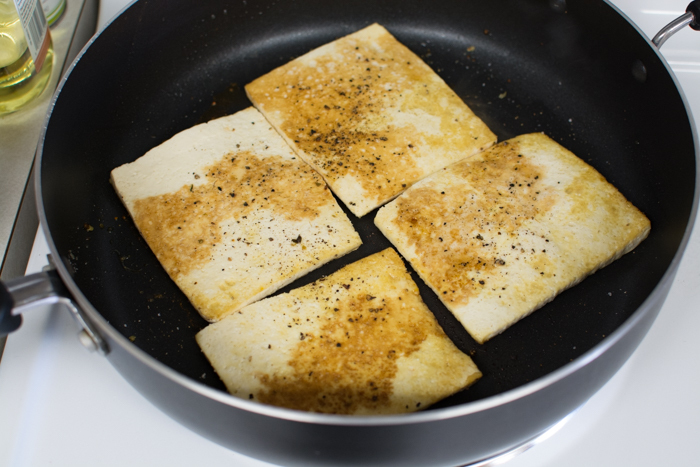 While that was going I preheated a nonstick pan with coconut oil and prepared tofu The Vegan Zombie Way. I used salt, Sunny Oaxaca Ancho-Coffee Rub, garlic powder, black pepper, and a splash of tamari as my seasoning. Once that was done cooking, I placed it back in the tofu container and into the fridge for some chillax time. Once the noodles were done, I drained them, rinsed them in cold water, and placed them in the fridge to join the chill party. While all of that was happening Jeremy was washing all of the veggies. Thank you Jeremy! 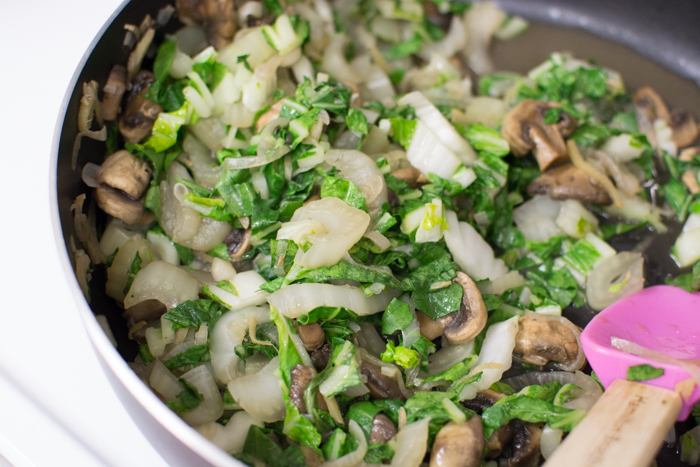 I then swooped in and filled a bowl with thinly sliced bok choy stems (save the greens), white mushrooms cut into thirds, one inch of ginger, and thin slices from half of an onion. Once the tofu was done cooking I wiped out the pan, added a teaspoon of toasted sesame oil and let these guys cook for 7-10 minutes on medium low heat with the lid on to sweat them out. 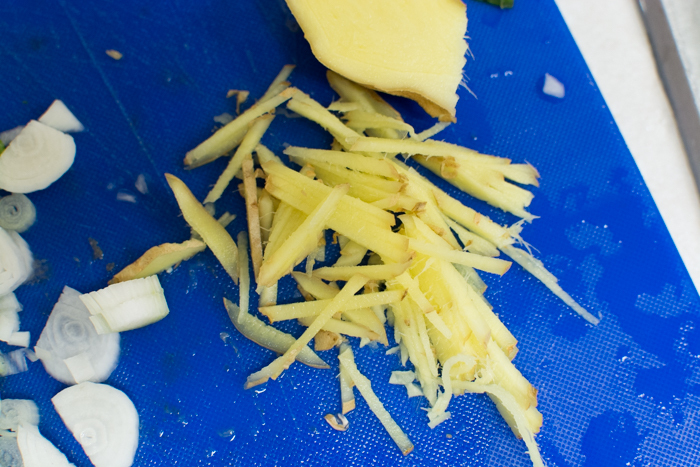 While they were cooking I thinly sliced the green part of the Bok Choy leaves. 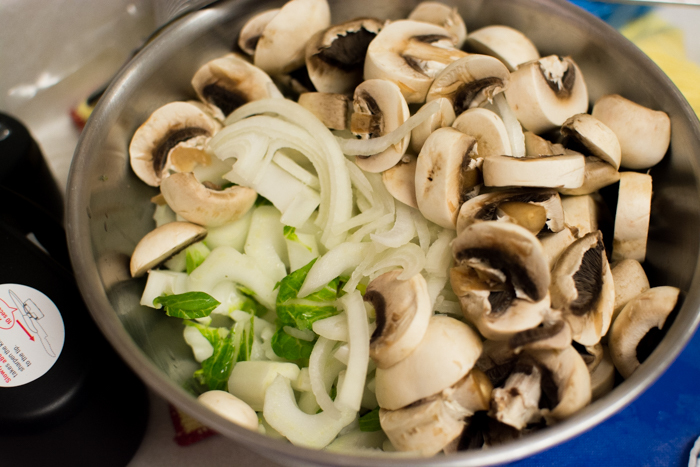 I added them to the pan for a brief two minutes of cooking just enough to soften the leaves. While that was finishing up I made a dressing of 1/3 cup tamari, 2 tablespoons agave, 1 tablespoon coconut sugar, 1/3 cup rice wine vinegar, 1 inch of ginger, and 3 cloves of garlic. I added everything to the small NutriBullet cup and blended it completely. Into a large bowl I added half a head of HUGE romaine that had been thinly sliced, 2 green onions – chopped and sprinkled with salt, approximately 1/2 cup of chopped cilantro, about 3/4 of the cooked cooled soba noodles, all of the cooked bok choy/mushroom/ginger mixture, and the dressing. I tossed that several times to mix it all together and then brought the tofu out of the fridge and sliced that into sumptuous little slivers. 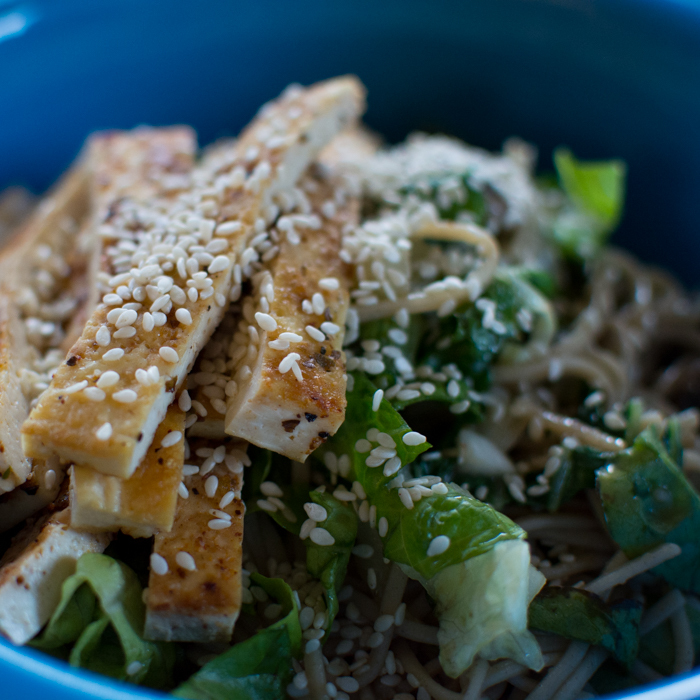 Oh and a sprinkle of sesame seeds for each bowl. So damn good. It was the perfect temperature for eating right away! We whisked it out to the porch to eat under the fading sunlight. I particularly liked the little bright spots of flavor from the Sunny Oaxaca rub—it has notes of coffee, ancho chili powder, oregano, and cinnamon. Just enough to bring an unexpected excitement to the otherwise Asian seasoned dish. If a similar rub isn’t available, I’m sure a chili powder or ancho chili powder would suffice. 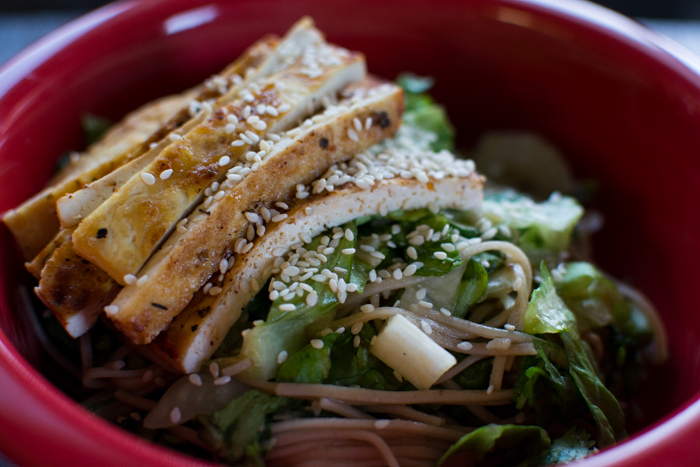 This was such a great way to use several greens in one dish, but not have a boring salad thanks to the tofu and soba noodles. Mmmm mmm I can’t wait to make this again!